The global aluminum market is characterized by large and mid-sized companies. The top six companies, viz Sun Chemical Corporation, Zhangqiu Metallic Pigment Co. Ltd., Carlfors Bruk AB, Silberline Manufacturing Co. Inc., Carl Schenk AG, and Altana AG hold around 48% of the market. Altana AG, in 2015 emerged as the leading player in the market, with a production of different types of aluminum pigments. It is expected that the threat of new entrants will be low as the existing players have established a strong sense of trust among the consumer base. The entry barriers for new players include high cost of machinery installation, high cost of raw materials, and lack of expertise in assessment of technology and equipment, states a new report published by Transparency Market Research (TMR). 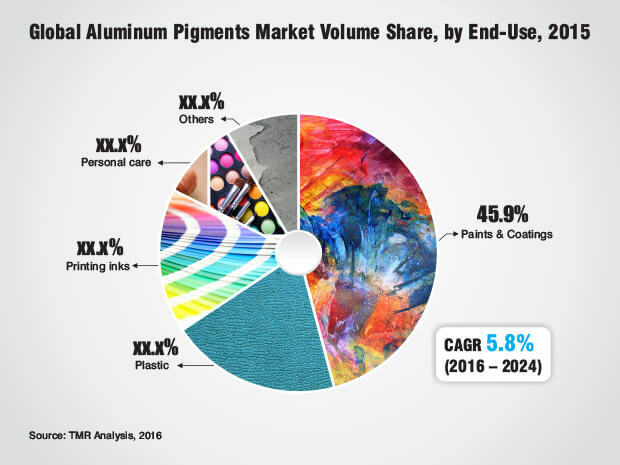 According to the TMR report, the global opportunity in the aluminum pigments market is estimated to rise to US$581 mn by 2024 after being worth US$332 mn in 2015. The market is predicted to expand at a 6.4% CAGR between 2017 and 2024. By end user, the market is currently led by the paints and coatings industry, which generated a revenue of about US$21 mn in 2015. The high demand for paints and coatings in the automotive sector is boosting the sales of aluminum pigments. The growth of the automotive sector in Brazil, China, and India is another factor boosting the growth of the market. On the basis of geography, the Indian and Chinese aluminum pigments markets in Asia Pacific especially are expected to provide lucrative opportunities for growth in the coming years. The high demand for aluminum pigments in this region owing to a rapid development of industries will drive the market. Another factor boosting the growth of the market in the region is the continuous growth of disposable income, enabling players to opt for better quality products. Automobile sector in the region is also responsible for the high growth of the market. The paint and coatings industry is one of the key factors driving the growth of the aluminum pigments market. Aluminum pigments help enhance the opacity of printing inks on difficult surfaces. These pigments improve the visual appeal and also enhance the legibility of the print. Another factor boosting the growth of the aluminum pigments market is the booming automotive industry. As customers have an increasing preference over car colors, the demand for aluminum pigments is expected to soar. Growth in disposable income is another important reason behind the growth of the market, as this allows customers to opt for high quality automobile paints and coatings, which make use of aluminum pigments. The personal care industry uses aluminum pigments in products such as hair gels, lip gloss, body wash, shampoos, eye shadows, and nail polishes. These pigments are also used in various ink types such as screen, gravure, and flexographic inks. On the other hand, growing carbon footprint has become a major issue for industries and this is causing a concern in some countries. Thus, regulatory pressure is being applied on manufacturers of pigments and chemicals, causing harm to the environment. As a result, manufacturers are shifting to eco-friendly products and methods.